Long has the moon captured the imagination of world; from science fiction to astrology; howling wolves to lunar calendars. To President John F. Kennedy, however, the moon was a destination. To put a man on the moon would be to challenge Russia's recent achievements in space exploration and assert the US's technological prowess on the world stage. As we know, the mission was a success, and yet while everyone is familiar with Neil Armstrong's iconic line and his bold tread on the moon's dusty surface, few are privy to the events leading up to this moment. 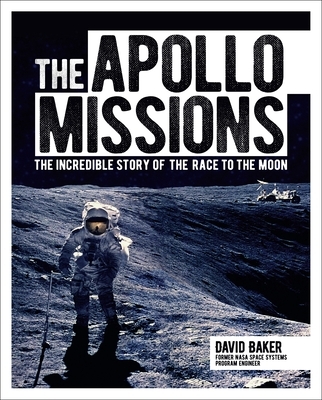 Former NASA engineer, David Baker, gives a behind-the-scenes account of the space race, including the political impetus behind the mission, the Apollo 8's lunar orbit on Christmas Eve, as well as some of the tale's tragedies. Bursting with fascinating stories, striking photographs of the team and exclusive material provided by NASA personnel, this book perfectly captures the risk, complexity and gravitas of this immense journey. Dr David Baker worked with NASA on the Gemini, Apollo and Shuttle programmes between 1965 and 1990. He has written more than 100 books on space flight, aviation and military technology and is the former editor of Jane's Space Directory and Jane's Aircraft Upgrades. In 1986 he was made a member of the International Academy of Astronautics by NASA manned flight boss George Mueller and is a Fellow of the Royal Historical Society and a member of the U.S. Air Force Association. He received the 1998 Rolls-Royce Award for Aerospace Journalist of the Year and, in 2005, was a recipient of the Arthur C Clarke Award. In October 2017, he received the American Astronautical Society's Frederick I. Ordway III award "for a sustained excellence in space coverage, as well as engagement in the early U.S. space program". Baker is currently a fellow of the British Interplanetary Society and editor of the monthly Spaceflight magazine.